Doctors have noticed an increase in Hepatitis-C infections in pregnant women, according to a study from Vanderbilt University Medical Center. In five years, from 2009-2014, the number of Hepatitis-C infections in pregnant women has almost doubled. Researchers say it’s a consequence of the opioid epidemic, which is concentrated in rural areas of the country. The virus has affected 3.5 million people in the U.S., making it the U.S.’s most common blood-borne infection. Hepatitis causes swelling of the liver, and hepatitis C is caused by a virus. Injection drug use is the main risk factor for the hepatitis C virus as often people share needles, filters, and other drug paraphernalia. People can also catch the virus from contaminated needles used for tattoos or contaminated blood flecks on shared items such as nail clippers, razors, or toothbrushes. If you have hepatitis C, you may have no symptoms, or mistake the symptoms for something else. The virus can silently cause liver damage and if not treated, lead to cancer of the liver. A blood test is the only way to know if you have hepatitis C. Unlike the test for hepatitis B, this test is not given to all pregnant women. If you have possible risk factors, your health care provider should offer you the hepatitis C test. You can also ask for a test any time. Can I have treatment for Hepatitis C when pregnant? The main treatment for Hepatitis C is a combination of two drugs, called pegylated interferon and ribavirin. However, pregnant women are not able to have these medicines as they might cause birth defects for their unborn child. If you do need treatment for Hepatitis C, you can start after the baby is born. Can Hepatitis C Affect My Unborn Baby? 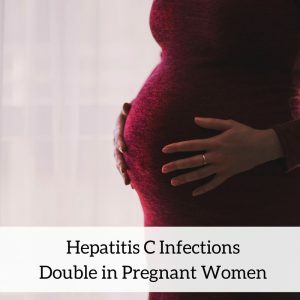 Researchers are still studying the effects of hepatitis C in pregnancy, but they know that moms with the virus are more likely to be give birth prematurely or have a baby with a low birth weight. Women with hepatitis C are more at risk for gestational diabetes. The risk of the mother with the infection passing the virus to the baby is a 1 in 25 chance; the risk is the same for both vaginal delivery and cesarean section. What else should I know about Hepatitis C? It’s important not to drink alcohol if you have hepatitis C, as this can increase the risk of damage to your liver. Furthermore, if you are taking medication for hepatitis C, use effective birth control until you have finished the treatment because of the risk of birth defects. Typically, a doctor will say it’s safe to try for a baby six months after treatment has stopped. Hepatitis C infections among pregnant women increasing.